My new friend, Monika, who lives in Germany, posted a photo of this on the doll quilt swap group and started a firestorm! It was decided that a swap was in order and I was enlisted to run it. We had people from all over the world signing up to take part and we've closed the sign-ups now and have 127 people swapping mug rugs. They'll all get their partner info on Saturday. It's been very time-consuming and that's why I'm not blogging much, or visiting other blogs. Plus, I'm a swap mama in 2 other big swaps, one is winding down and the other is just starting, so there's a lot of initial stuff to do. Plus I have orders to fill AND Jim just came home with an abandoned dog, who needed a bath desperately and it looks like we're keeping her, dangit. I don't need another dog, this will put us back up to 3 big dogs. God, I hate people who dump their animals. She's maybe 7 months old, part yellow lab and was covered with seed ticks, covered! And one flea. Grrrr. She's very sweet though, for a new girl. Acts submissive to the other dogs, which is smart. Gosh darn it. Just when we were getting used to having just the 2 big dogs, now these 2 are all crazed and acting like morons. The cats will freak out once they see her, we haven't let her in it because of all the ticks. They're dying though and falling off and being combed off, like crazy. She has a vet appt this afternoon for shots and a heartworm test, please let it be negative! And she needs a name. Photos later. I did find time to make a practice mug rug for Jim, he likes it and so do I.
I like the mug rugs and wish I had know about it soon enough to join in. Have fun with the new family member. How do you find out about these? This one was small enough that I could have played. 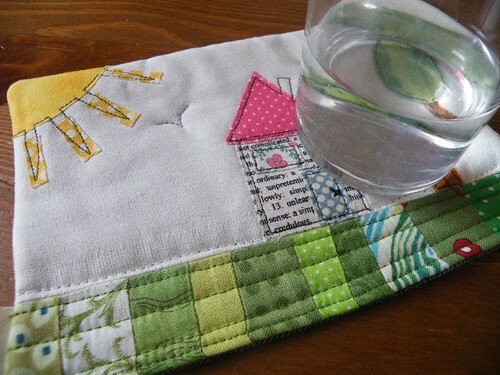 I have had such fun reading about the placemat, and doll quilt swaps, but I didn't read anything about where you could do this... Help! I think you should name her Dolly Mug....she came at the end of DQS9 and at the beginning of the Mug Swap! ;) You all are kind, kind people...there needs to be more Flossie and Jim's in this world!! You have done a wonderful job on this swap! Thanks again for doing it! 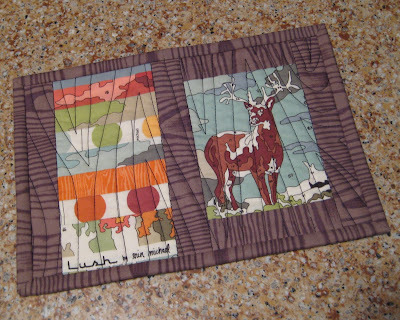 Super excited about the mug rug swap! I know the new dog is loving his new home. Wow!! This is going to be a huge swap! I can't wait to get my name tomorrow. Congratulations on your new family member. She sounds like she needs some TLC and you guys rescued her just in time. How sad that she had to live with all those ticks. Very sad. You have your hands full girl. And thanks so much for handling this new swap. Hi Susan! I'm so with Alice R!! How do you know? For me, the shipping is doable too as well as the size! I would love to join you all on the NEXT round! How do we find out about these??? 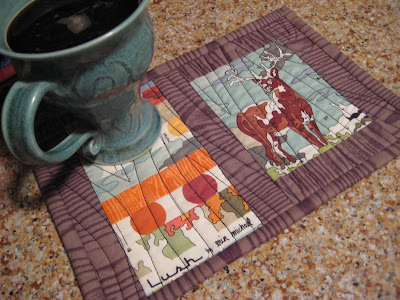 I totally love your dear-mug-rag ! I have the painters pallet color dots,but not the rest og the line. Looks like hard to find.. Anyway, bet Jim is happy !